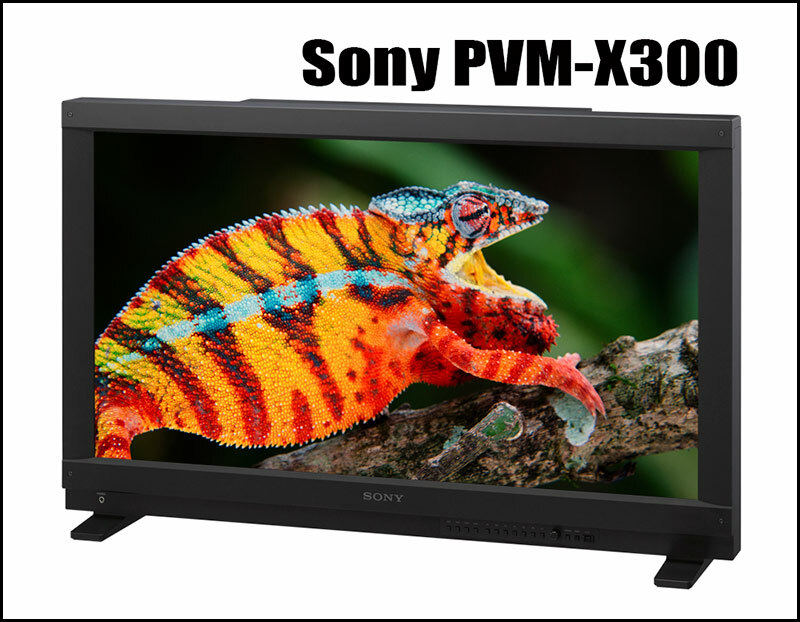 At this year’s show, Sony is demonstrating the broadest range of cameras and solutions for 4K content creation in the broadcast market with the PMW-F5, PMW-F55, F65 and the trade show debut of the PVM-X300 4K professional monitor. 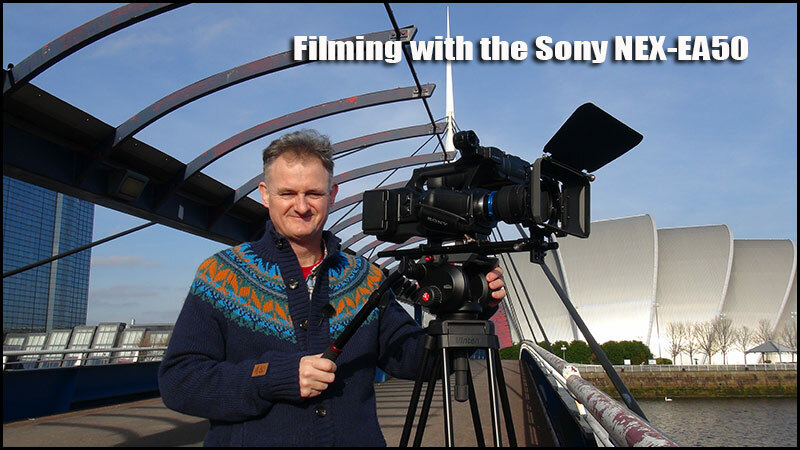 The show also sees Sony exhibit the full breadth of its industry-leading production tools, including the large sensor NEX-EA50EH and NEX-FS700E, as well as the handheld XDCAM 422 range – comprising the PMW-100, PMW-150 and PMW-200. 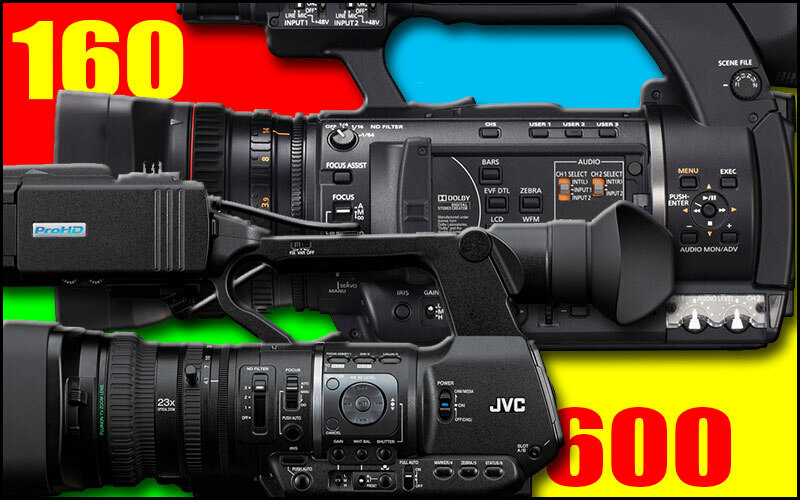 Over the last few months I have reviewed the Panasonic AC160 and had a 160A for a couple of days not to mention the JVC HM600 I reviewed recently, the question I keep getting asked is which camera would I choose. Both cameras are competitively priced with the Panasonic AC160 coming in at £3,719 and the JVC HM600 at £3,499, it’s not a coincidence that the JVC is £200 cheaper so if it’s price then the JVC wins. Feature for feature the cameras are very similar but the Panasonic does stop at 25Mbps 1080 50p while the JVC goes up to 35Mbps broadcast ENG but for many the 1080 50i is not very appealing. I tested both cameras at 720 50p and the Panasonic was rock solid on tight shots but the 25Mbps VBR gave in my opinion variable quality wide shots, some were great and some were average. The JVC is rock solid on both wide and tight as the extra 7Mbps VBR helps the wider shots. 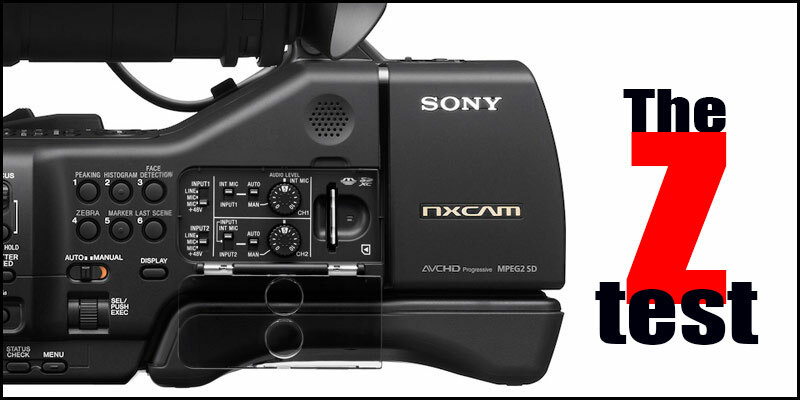 Both cameras are 1/3″ so the low light capabilities are fine up to 6dBs, don’t expect to find any 1/3″ camcorder to perform well in low light though these cameras are far better at 0dB than the competition as they are more sensitive. If you are looking for a 1080 50p camcorder the Panasonic 160 is top dog but for £200 less and a 35Mbps broadcast news approved camera the 600 is your choice. You also have to take into account the look and feel of the cameras, the JVC is less plasticky than the Panasonic and is also slightly smaller in size. If the JVC had 1080 50p it would be a no brainer, JVC are looking into upgrading the 600 to 1080 50p but have admitted the fan as it stands is not capable of running the camera cool enough to accept 1080 50p. I don’t do interlaced footage and use 720 50p or preferably 1080 50p when available, both cameras give a good clean 720p image which looks far better compressed down to SD DVD than 1080 50i. Lastly if there is one single item that would sway me one way or other it would be customer service…JVC have excelled at upgrading the 600 camera with at least 3 FW upgrades over the last two months, I mentioned that in order for the flash banding to work you need to switch off the shutter which could be a pain when filming at a wedding so JVC have upgraded the software to have the shutter off as default which means the camera is always set to 50 fps in default mode. 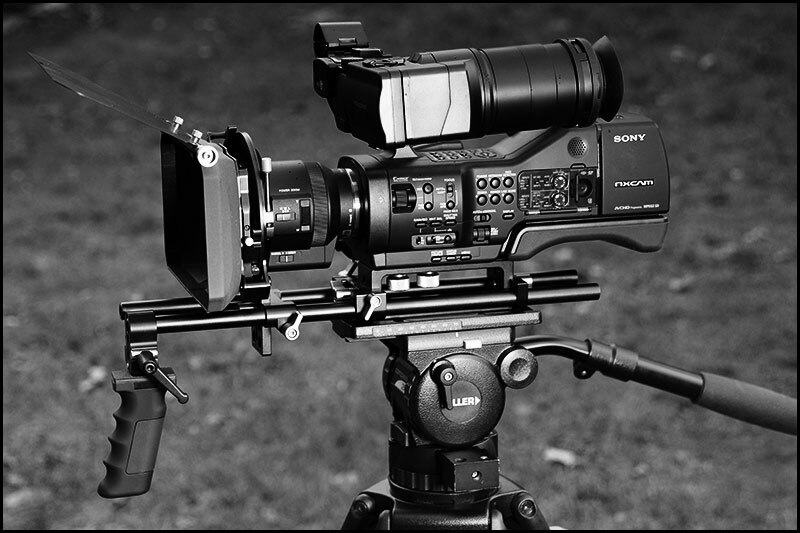 The Panasonic 160 has sold well and the 160A with 1080 50p and better lens tracking is also a good seller, JVC are very pleased with the uptake on the 600 and will hopefully have further news and FW update announcements during NAB 2013 but then maybe Panasonic have something extra up their sleeve for NAB…exiting times. Stay tuned for some interesting news. Not 1080 50/60 before i get asked but indeed something that may turn a few heads. Update : Live streaming from the 650 will be an april launch……its not been a secret however exact details are tbc. The news i was reffering to is more about a large order we have secured for the 650 model. All will be clear when we do an official press release soon. NAB and IBC are typically new product launch dates so for those who have asked dont expect too much until then or just before. 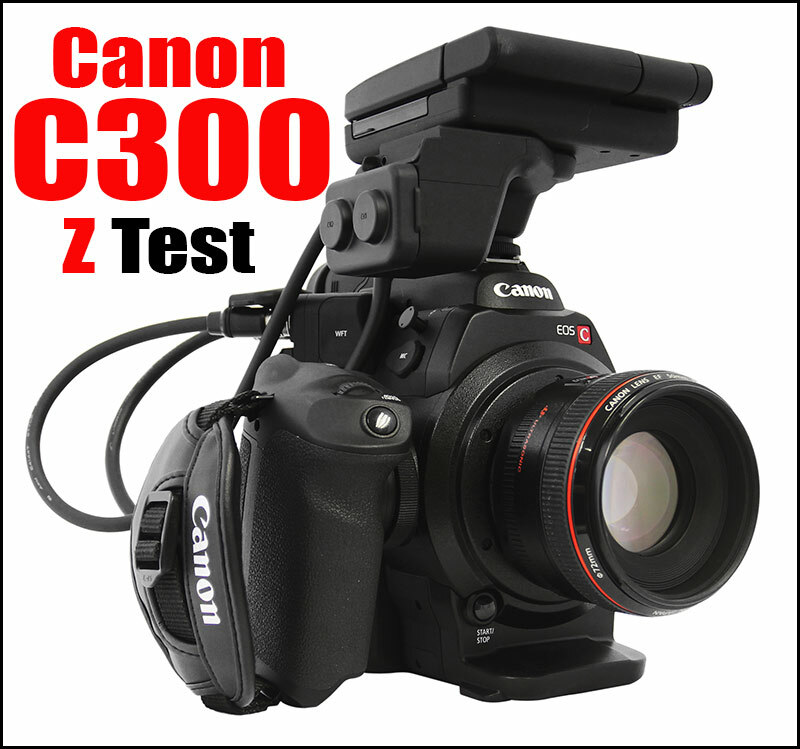 Canon C300 “Z Test”…When the power fails ? I had to wait till my filming was done this morning before performing the Z Test on my very own Canon C300 as a dead C300 is not good news for future work prospects ! The Z Test allows me to inform you how a camera will perform under major stress during recording and one major stress is a sudden loss of power, while recording I disengaged the battery causing an immediate power failure, does the recording survive ? 2. 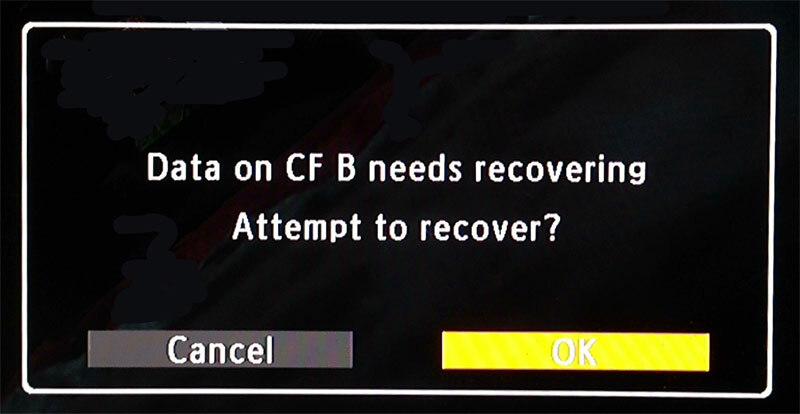 From 35 seconds onwards you will get an attempt recovery warning on power up, you say “YES” and it then tells you to check the file. You will retain all but 8-10 seconds from the end of the recording which is very useful to know. 3. As a further test I recorded 5mins of footage and the last 7 seconds were missing. This all depends on the cameras ability to recover the file but interestingly it takes the same time (seconds) to recover 40 seconds as it does 5 minutes. At least we now know after 30 seconds your footage is written to card and all the information is recovered apart from the last 10 seconds, this should stop you having a major panic in the event of complete power loss. New firmware for Canon C300 v1.0.8.1.00 and still no 1fps for timelapse on PAL cameras ! While filming in Sainsbury’s this morning I decided to add some timelapse footage, to my horror when I flicked through the menu I discovered Canon had only provided a minimum of 2 fps and not the world standard 1 fps. Who in their right mind designs a £10,000 camera with a 2 fps timelapse feature…I then remembered watching an early video review done by Philip Bloom commenting on this very topic and noting how stupid Canon had been to produce the XF305 the exact same way. If I had noted this to JVC I would have had a FW update within two weeks and yes both the JVC GYHM600 and 650 have a timelapse of 1 fps and the 600 is 4x cheaper than my C300. The C300 has been out for months now and only this week we get a FW upgrade that says “Efforts to correct image color fringing when a subject is of high contrast have been made.” So these “efforts” to correct colour fringing have been addressed and not a major flaw in the cameras design which would be easy to correct giving us 1fps for timelapse. 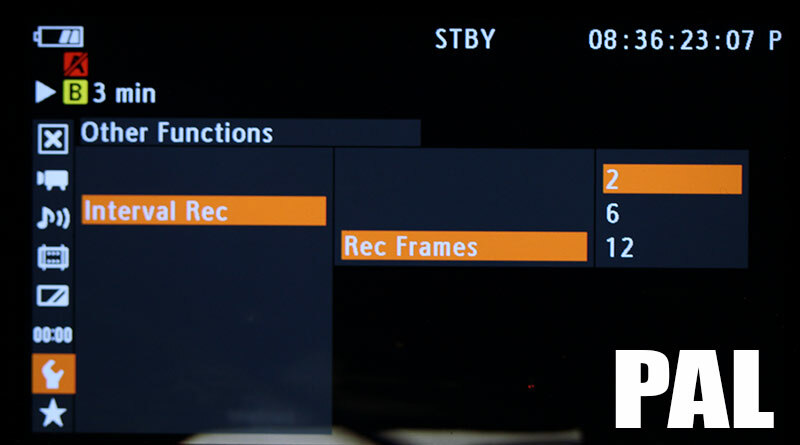 Using the present settings you would get 1 extra useless frame every 5 seconds making the end result stuttery to say the least ! 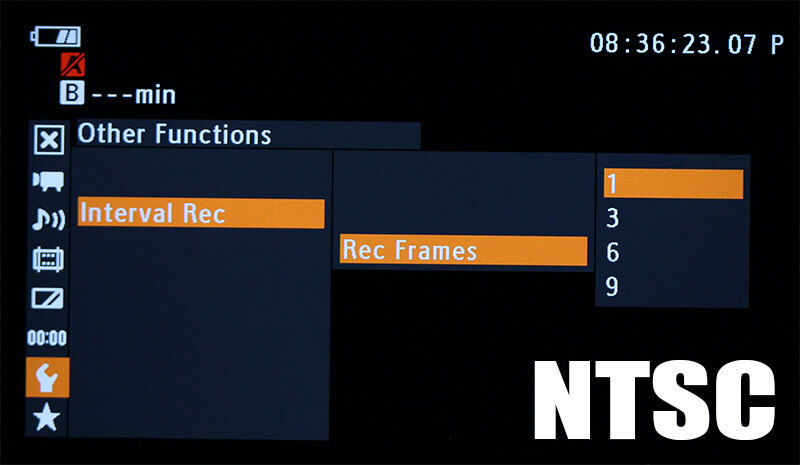 Shocking news from across the pond in the US is that NTSC which is switchable on the camera gets 1fps while the UK are stuck with 2fps…WHY CANON ? So why don’t I just use NTSC when recording time-lapse…because I should not need to and it also requests that you re format your CF card if switching to NTSC…this is shabby design by Canon when every other camcorder in the universe gives PAL users the ability to run at 1fps. As usual in Scotland we are weather dependant, today was a fine day for taking the Sony EA50 out for a spin, my wife Susan used the Sony NX30 and she took this picture of me at Bell’s bridge in Glasgow’s Clydeside. I tried both lenses the Sony 18-200mm and the Nikon 24-85mm with a 77mm GenusTech fader, the Sony lens did suffer not having the fader as I don’t have a step up ring big enough to fit, I was getting f22 at 0dB at a shutter of 50. You really miss the lack of ND filters but this is a large sensor camera, Sony need to stop producing such cameras with no ND and the inability to go beyond 0dB, -3 and -6dBs would have helped. I need two more days with the EA50, one for studio shots and one for low light shots, I hope to have the review up at the beginning of next week. I still can’t produce any moire patterning so far. 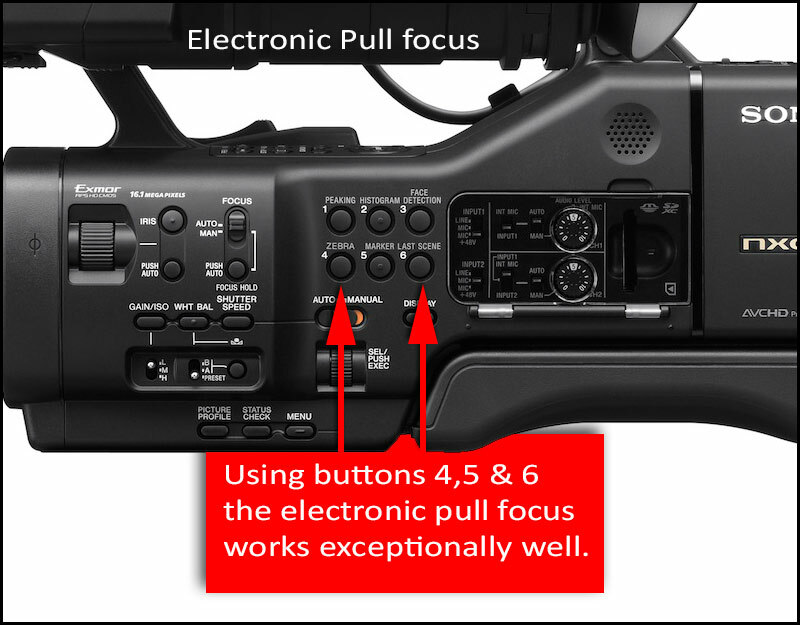 Electronic pull focus is a gimmick…or is it. Apart from the very confusing convoluted way Sony implement the pull focus it works a dream and you can pull focus between A and B with no disturbance in the picture. 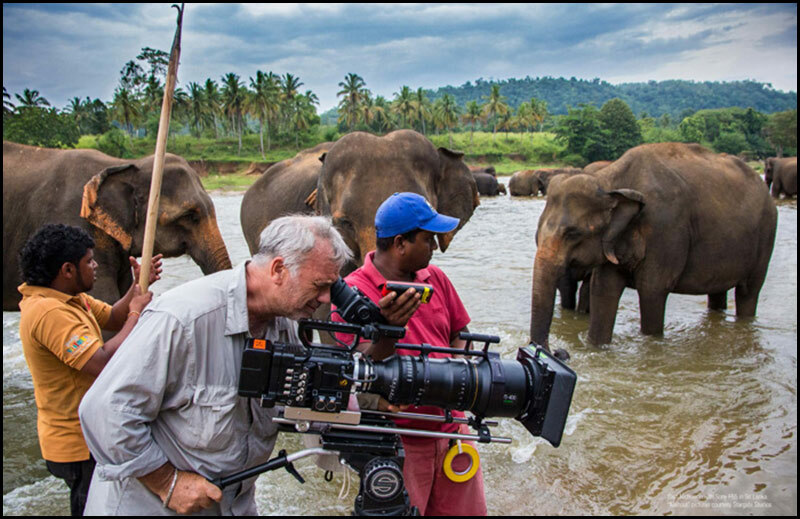 This works on long shots you would never dream of doing with a conventional lens, Sony should develop this further using an iPhone or iPad as its very confusing setting it up and executing on camera. The short flange between lens and sensor filter makes this camera prone to dirt as will be demonstrated on my video review but with a careful clean using a Giottos rocket air blower, you can get rid of 99% of dust. Update : One of my readers Ron Evans has just pointed out “Spot Focus” this is a feature that works in manual focus mode only. You simply press your finger on any spot of the cameras LCD and the camera will focus on that spot, just tried it and it works a treat. The difference between spot and focus transition (pull focus) is that in spot mode you only get one focusing speed but in focus transition you get a choice of transition speeds. 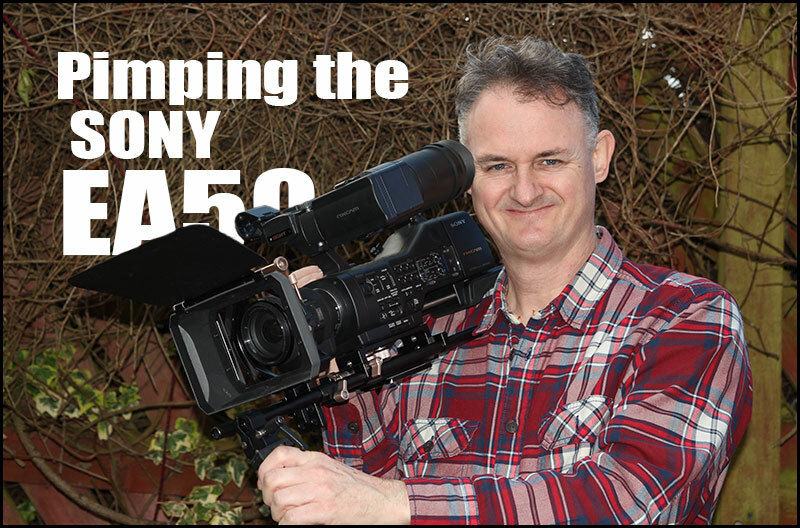 I have been using the Sony EA50 this week on and off, it’s probably the busiest time in my schedule work wise and fitting in a video review is very tricky to say the least. 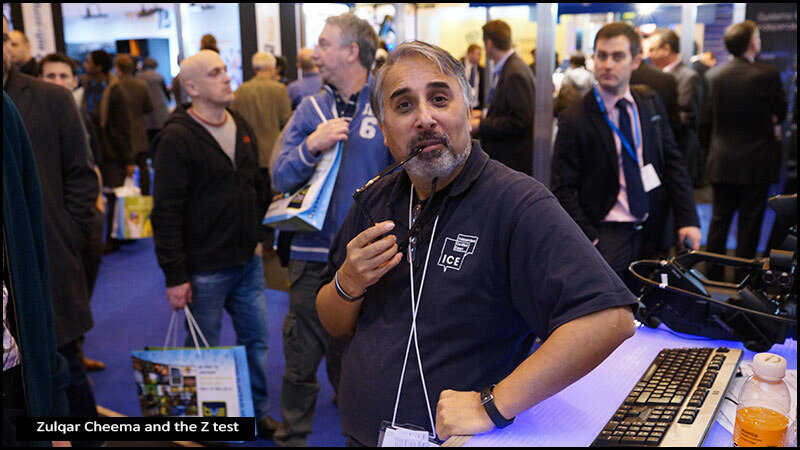 My good friend Zulqar Cheema has also just spent some time reviewing the Sony EA50 and gave me a good tip…the Z test. Interestingly the Z test is not for the faint hearted but if you think about it an essential bit of knowledge for all of you thinking of buying the camcorder…so what is the Z test. If your battery fails will your precious footage still be recorded as we all know horror stories of lost footage and corrupt cards. Between us, Zulqar and myself christened the Z test as he was the first pioneer to try this test and here are our combined results for the Sony NEX-EA50. 1. Up to 30 seconds if your battery fails in the EA50 you will not have any footage on the SDHC card. 2. 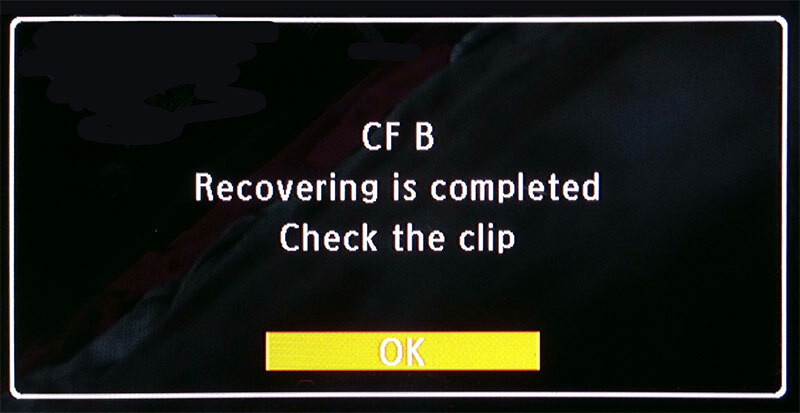 40 seconds will give you 38 seconds of footage with a recovery message pressing the OK button, this is very impressive. It seems the EA50 buffers up to 30 seconds of footage at any one time which explains the total loss up to the 30 second mark but the good news is that if the battery fails and you power up the camera you get a recovery message, by pressing YES most of your footage give or take 10 seconds will be saved to your SDHC card. This alone makes the EA50 a great wedding camcorder as you can confidently film knowing that after 30 seconds your loss will be contained to a maximum of 10 seconds of lost footage. I had a spare set of rails thanks to GenusTec which I have added to the EA50 meantime, this also allows me to use my matt box with my 24-85mm Nikon lens and MTF adapter. I have also installed the GenusTec 77mm vari filter to the Nikon lens. Days after settling an email-hacking lawsuit with rival camera makers ARRI, Red Digital today sued Sony Corp for patent infringement. The high-tech camera manufacturer’s complaint Tuesday claims that three cameras made by defendants Sony Electronics and Sony Corporation of America “all embody the subject matter claimed in Red’s asserted patents without any license.” The federal court filing adds that “Red is informed and believes and thereupon alleges that the sale of Sony’s unauthorized, infringing cameras has resulted in lost sales, reduced the business and profit of Red, and greatly injured the general reputation of Red.” Alleging two instances of “willful and wanton” patent infringement on technology used in its Red One camera, Red is seeking a court order that its patents are “valid and enforceable” as well as an injunction against Sony’s F65, F55 and F5 cameras to stop their further sale and have them destroyed. 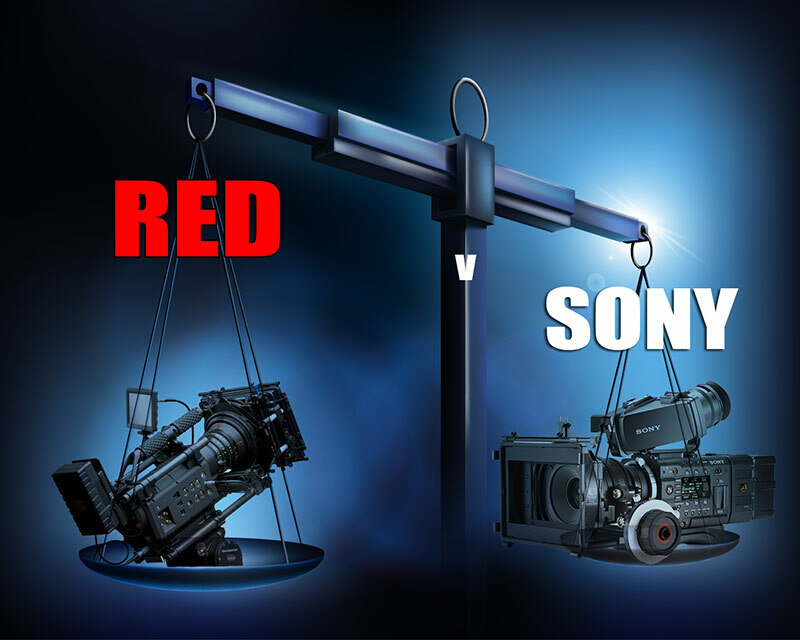 HDW : It’s a sorry state of affairs when companies take legal action, but it’s also very sad that RED have to admit publicly that the arrival of the F5/F55 has damaged them so much, personally I think RED should take it on the chin and concentrate on making and improving their cameras. The writing has been on the wall as large sensor cameras have been pouring out of Japan over the last 14 months and Sony had to catch up with the competition at some point. 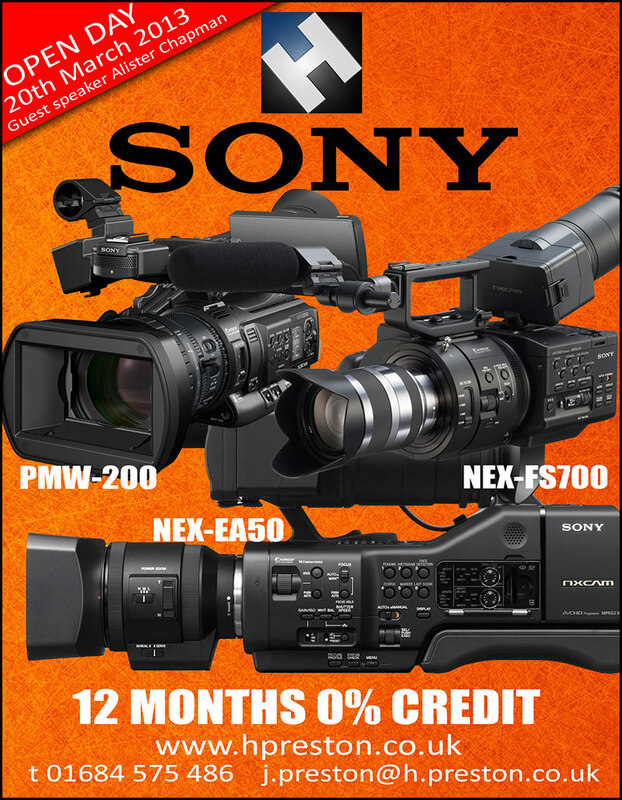 This sort of publicity and public admission will be far more damaging to RED than the advent of the F5/F55 and remember it’s only this week that Sony product has become commercially available. RED have had a good run up till now and to contemplate suing a company as big as Sony is a very bold move indeed…not for the faint hearted or those without deep pockets. HAVOC from André Chocron // Frokost Film on Vimeo.